Ensconced in my current obsession with all things cultured, I’ve spent the last few months struggling to crack the water kefir code. 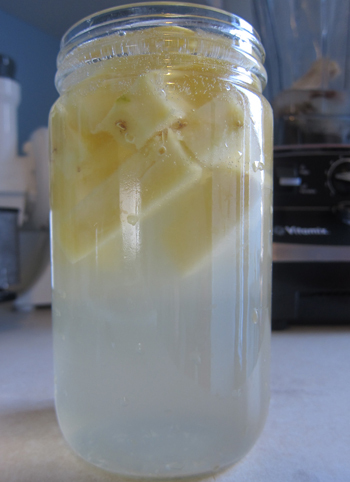 Water kefir should be light and refreshing, mildly sweet and fantastically fizzy. So fun! 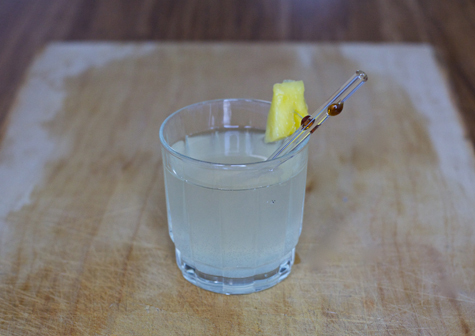 It’s basically homemade fruit soda – but with a probiotic twist. And finally, finally I’ve got a technique down pat and I can share it with you guys. But first . . .
What the hell is this stuff?? Called water kefir – Tibicos – Japanese Water Crystals – Bébées – African Bees . . . mmm, sounds pretty mysterious, right? And it is! It’s magical stuff, man. 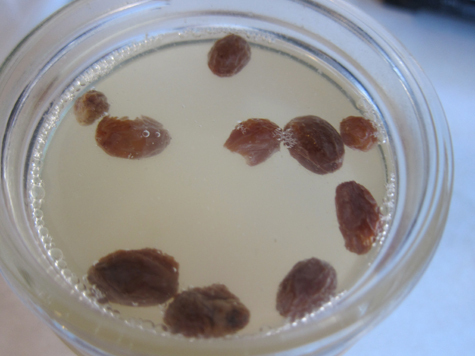 Similar to our old friend kombucha, water kefir ‘grains’ are a symbiotic colony of bacteria and yeasts (a SCOBY). 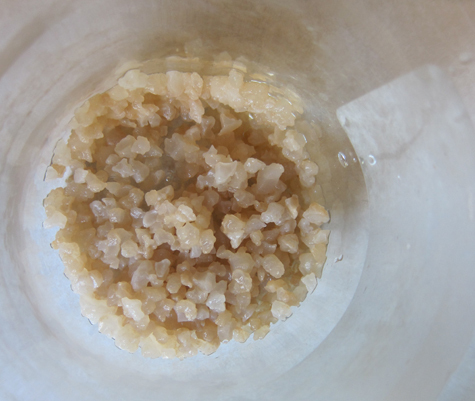 But unlike the gelatinous alien blob SCOBYs associated with kombucha, kefir grains are held in a molecular matrix that gives them their delightful crystalline aesthetic. Well, at least I think it’s delightful! I got mine at my local co-op, and those of you in bigger cities may be able to do the same. I’d also check Craigslist and Freecycle and your health food store bulletin board – and post a want ad! Finally, you can always order online. I hear good things about the kefir lady. Once you have your grains, reconstitute them as directed. Once the sugar is completely dissolved and the water has cooled to room temperature, add the kefir grains. Cover with a breathable barrier like a coffee filter or a rag and secure with a rubber band. Allow to ferment on the counter top for 24-48 hours. You’ll know it’s working because bubbles will form and the fruit will float to the top. It’s carbonated!!! Mmm, fizzy fruit. Carefully fish out the floating fruit (never let metal touch the grains). Eat that fruit! Pour off the water kefir into a second glass container. You can drink it as is but it’s not so tasty. The next round will add flavor while increasing the probiotic load. 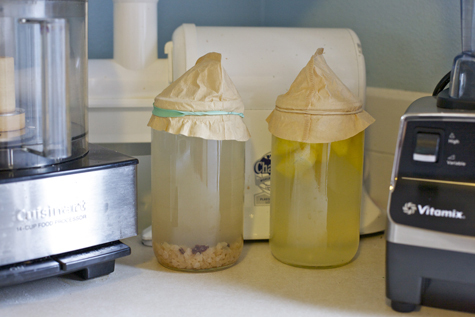 So now you have your grains, separated, and your water kefir liquid on it’s own. Set the grains aside. To the liquid, add about 1/2 – 1 cup fresh organic fruit (chopped). I like juicy fruits like pineapple, raspberries, etc, as opposed to things like apples or bananas. Add the fruit, re-cover with your breathable barrier, and allow to ferment on the counter top another 24-48 hours. 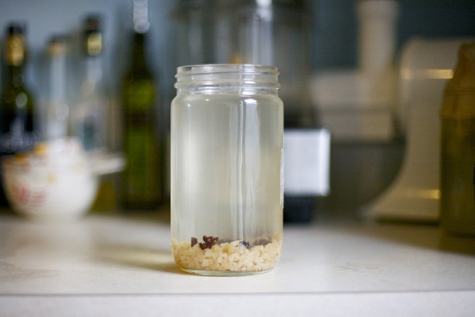 Meanwhile, take your kefir grains back to step one, rinse them off, and start over. In this way, you’ve got a continuous stream of water kefir coming in. After the second ferment you can ‘bottle’ it (I use glass mason jars) and store it in the fridge. I like to drink my water kefir in my morning green smoothies, but it’s great on its own – a homemade healthy soda! Enjoy it with dinner. 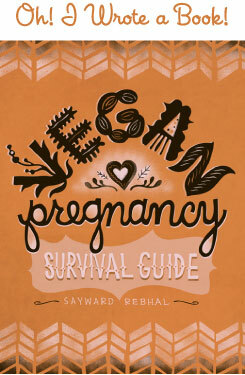 Having something fermented with every meal is a great habit, as it greatly aids in digestion. If ever you need a break, go on vacation, or just get tired of water kefir for a while (say it ain’t so! ), you can always store your grains in the fridge. They’ll happily hibernate in a sugar/lemon water solution. I’m so excited, I just got my water kefir grains from the kefir lady, gonna start today! Recently had KeVita coconut-water kefir and loooooved it. So expensive, though, so I’d really be excited if I could make it myself! Do you know if this method you use would work w/ coconut water? Would I still add the sugar and dried fruit? @ Katie – I have made coconut water kefir several times, and it works the same, except you do not need to add sugar. You may add dried fruit if you like. I don’t, not even for water kefir (to which I usually use 1/4 cup of maple syrup for the sugar). I usually add fresh grapefruit and/or orange juice after straining the kefir into clean jars and then let that do a second ferment for 24 hours. Lovely. @ Katie – Denise (our resident kefir expert!) is totally correct. No need to add sugar with coconut water, as it’s already full of natural sugars. Some if the ladies on the Natural Parenting Network wall on Facebook pointed me in your direction. Do you know anything about the safety of kefir while breastfeeding? I’d love to start drinking water kefir again (I stopped when TTC) but I’m not sure I didn’t read something negative about that? Do you have any mercury/amalgam fillings? How “clean” has your diet been? Ie, is there a lot of crap to detox, or have you already been eating well for a long time? I think it’s probably just fine (I do it! ), but I’d start with a small amount and work up. If you’re worried about food poisoning or something like that, well I suppose that’s technically a risk. But if you’re doing things right, it’s not something that I personally worry about. I got mine in a kit and used the whole lot in each batch – I’d say it was about 1/4 cups worth. Hope that helps! Thanks for this post. Going on vacation tomorrow and as worried about my water kefir grains as I am my puppy!